There’s a saying some circles: There are two kinds of music, TRAD and STAD. (S—t, that ain’t Dixieland.) If you’re a strict adherent to the former, then this review won’t appeal to you. However, for the rest of you musically adventurous souls, this may or may not appeal to you. I was aware of Dolphy’s multi-instrumentalism and his important place as a jazz icon, but that was about the extent of my knowledge. 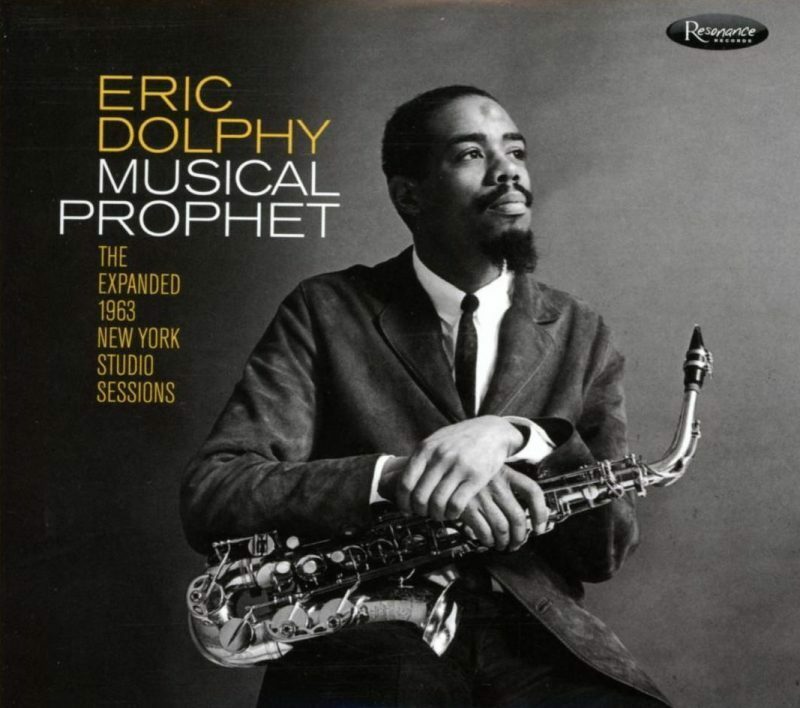 The full title of this 3 CD set is: Eric Dolphy Musical Prophet; The Expanded 1963 New York Studio Sessions. It is released by Resonance Records and produced by Zev Feldman and flautist James Newton. The set is accompanied by a 100-page CD size booklet complete with commentary by various artists. Two of the three recordings are reproduced on CD with supplemental recordings to make an approximate one hour each. The third CD is alternate takes from the previous two recordings, previously unreleased. All are mono-track recordings. The two recordings previously released are entitled Conversations and Iron Man. The accompanying 100 page booklet includes photographs, descriptions of how the recordings came to be made, as well as commentary from various artists about Dolphy’s life and musical artistry. Besides Dolphy, who performs on alto sax, flute, and bass clarinet, are the following: William “Prince” Lasha, flute; Huey “Sonny” Simmons, alto sax; Clifford Jordan, soprano sax; Woody Shaw, trumpet; Garvin Bushell, bassoon; Bobby Hutcherson, vibraphone; bassists Richard Davis and Eddie Kahn; and drummers J. C. Moses and Charles Moffett. Several personal take-aways: the previously unreleased “Muses for Richard Davis” was intriguing duet for Davis’ bass and Dolphy’s bass clarinet. Also, a discussion about how Dolphy would practice flute and birds would respond, so Dolphy’s practice might be interrupted by a flute-bird conversation. This reminded me of my own flute and chromatic harmonica bird conversations. Dolphy was a straight-arrow who avoided the drug/alcohol problems of so many musicians of that era. He was engaged to a Parisian dancer but died in 1964 at age 36 of an undiagnosed, untreated diabetic coma in a Berlin hospital. This is not a recording that is likely to leave the casual listener humming a familiar tune. But it will leave the perceptive listener was a greater appreciation of the talent and skill of multi-instrumentalist Dolphy and his talented performers.